All of us want to find the hidden paradise beyond this world. Well, I did at least. In the middle of my final exams at university, I met a Tibetan lama in the northeast lakes of County Cavan. He was the first in history to settle there, and was a great curiosity to the Parish Priest. I had not been searching for a guru, but when I met him in the Kitchen of that big old Victorian house, I felt immediately at ease with this man in burgundy robes, simple shoes, and brass framed glasses. He pointed at the donkeys, and chuckled, telling me that they did not worry about shopping. It was such a wonderful and such an absurd observation that I felt I had met one of those wise men, who have retained their childish innocence. I knew I had come to some kind of home. I took refuge. I fell at his feet. I can only call that karma since I had no prior warning that this would happen. Over time, he set me menial tasks like cleaning pots, and weeding. He taught me to make dal, and over the steaming pots he started to teach me Tibetan. He would laugh and say things like ‘Pum ba mi Dak Ba Me’. Which means Pots are Impermenant. True, or false? Monks thrash out these dialectical edicts in the courtyards of monasteries, arguing for hours over the true nature of things like pots. Are they or are they not impermanent? And are we, and the land and the sea and the mountains, permanent? But nothing is. Nothing lasts. But because we wish it to, we suffer. Lama O sent me to India to study Tibetan, because at the time I had been living in Krakow, Poland, where I was teaching and acting. He said, if you can learn Polish (which I did) you can learn Tibetan. He started the rudiments of the alphabet with me. We would sit at the round table, and I would marvel at these new letters that I had written in a musical notebook, between the bars. I began to imagine how it would be, when I got to Dharmsala: I saw the Dalai Lama on a hill, sitting under a large tree, meditating. I saw goats wandering in the snow mountains. I saw crooked old monks in bright old temples. All of that is there, but nothing would prepare me for the wild traffic of Dharmsala, the jeeps, the taxis, the motorbikes and rickshaws, the beggars, the exiles, the tourists. In my first year in India studying Tibetan at the Library of Tibetan Works and Archives, I met a lovely old man called Raj, an ex-diplomat who had dedicated his retired life to the study of Prajnaparamitra Buddhist texts, and humbly and with immense dedication, he translated these text from Sanskrit to Classical Tibetan, and back again. Prajñāpāramitā means “the Perfection of (Transcendent) Wisdom” in Mahāyāna Buddhism and refers to this perfected way of seeing the nature of reality, as well as to a particular body of sutras and to the personification of the concept in the Bodhisattva known as the “Great Mother” (Tibetan: Yum Chenmo). Searching endlessly for the meaning of Emptiness, Sunyata, in these texts, Raj always felt he was being eluded. He said he had even asked the Dalai Lama what the meaning of Emptiness was, and he had no answer. Raj would sit for hours with western Buddhists in the cafes of Dharmsala, thrashing out the possiblilities and the impossiblilites of Emptiness, and the karma that brings us to that place of liberation, and the karma that steals us away. Monsoon storms would brew in Dharmsala, the windows of the Shangri la cafe would blast open with the wind, the monkeys would flee, the river would swell, and still they would talk for hours over tea and noodles. And I would listen, picking up the scraps of evidence that might validate the possibilities of the nature of reality being of nothing but empty, in nature. The Heart Sutra, the shortest of the whole Prajñāpāramitā body of texts, ends with the mantra gate gate pāragate pārasaṃgate bodhi svāhā. I thought that if I hummed that long enough, I might get it. What struck me though was that there was little joy in these discussions, apart from Raj’s mishchevious intelligence and his delight in playing devil’s advocate. But the western afficionados of this philosophy- heavily accented Californians and French, seemed to be burdened by the intricacies of all of this business of Emptiness, rather than uplifted. I never got drawn into the arguments, I was more interested in the task that Lama O had set me: not to master the nature of reality, but to learn to speak in his tongue. At first, I struggled with Tibetan. I had a teacher called Ten-la, who drilled us in the endless imperfections of Tibetan grammar, and never explained a thing. When some European would ask a question, he would smile, and throw his cloak over his shoulder, and look beyond us, out the door. He would close the book, and walk to the Library cafe, for tea. I knew I was not going to learn like this. I needed to go further into the culture of Tibetans, into the hills, to the hidden monasteries. Besides nobody who was Tibetan would speak to me in Tibetan, and didn’t help that was teaching English to refugees down the hill from the library. 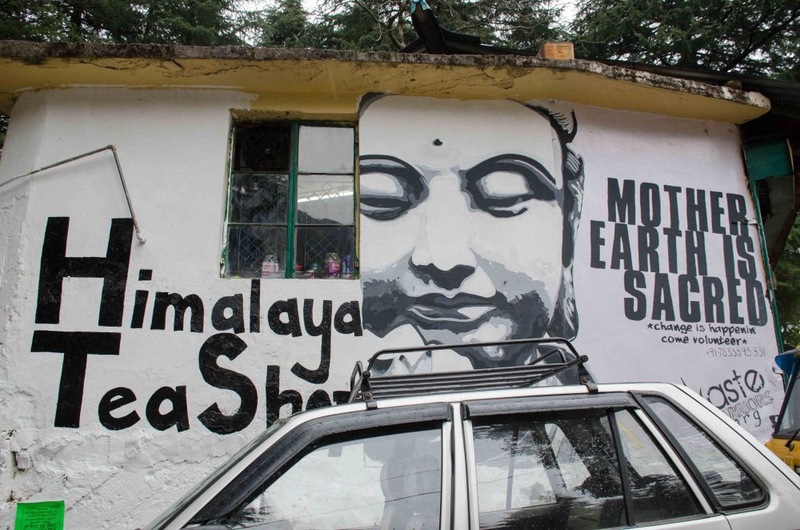 I booked my bus ticket to Manali, the town in the Himalayan foothills that has more hotel beds than Delhi, and is the starting point for the high hills on the Indo-Tibetan border- Spiti, Ladakh, Zanskar, Parvati Valley. At least, I thought, I would be escaping the rain. Coming from a land drowned in water, I was desperate to get away from rain and its insidious bedfellow, damp. I was raised in a Georgian house in a room at the end of the house with black mould creeping up its walls. It was one of things I feared most, along with spiders. The bus ride to Manali was twelve hours long, but it was nothing compared to the near death experience of climbing the Himalayan foothills to Spiti Valley into the most arid, sparse landscape I had ever seen. As we climbed the hairpin bends in the roads, I could not see the edge of the road. More than once, I saw the carcasses of dead buses lying in the crevices of the valley: the ones that didn’t make it. The locals were knocking back beer on the bus and singing songs, surely to distract themselves from the graveyard of buses and jeeps that lay far, far below us in the valley. The skies were without end. The land was beige and dark in places and we did not see people for a very long time, until we reached the Kunzum la, a pass with a holy Goddess dancing on the mountains. Below were the stupa in her honour, and the ubiquitous prayer flags that flutter on every Tibetan mountain pass. So it was that I became immersed, that year and for many years in Tibetan language- not only through books and scriptures, but through people. I began to see Irish faces in Tibetan faces. Their stories of exile and dispossession were the same, rhythmically though not temporally, as the Irish stories. But when I got to the Hills, I saw that not only were the Tibetans like the Irish in political experience, but in how they understoood land itself : it was full of stories. I grew to love the soft, earthy tones of Tibetan, and how it made me feel to speak in that tongue. 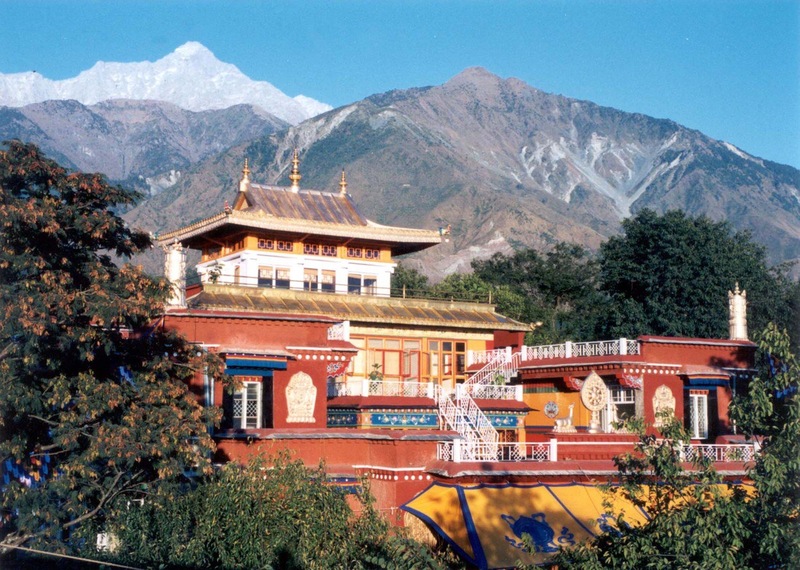 In Dharmsala, I was just another foreigner clumsily trying to acquire words in TIbetan. I could have become a translator. But I chose to, on Raj’s advice, go to the Hills, as Kipling did. 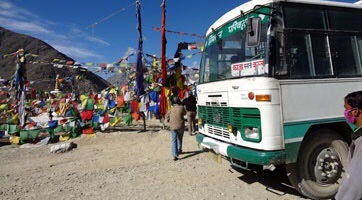 It was intensely exciting for me to climb those HImalayas in a rattly old bus. I was as far away from the sea as I would ever get. The sea, where I was born, or at least raised beside it. I lived in a hollow, windowless monastery on a crag. 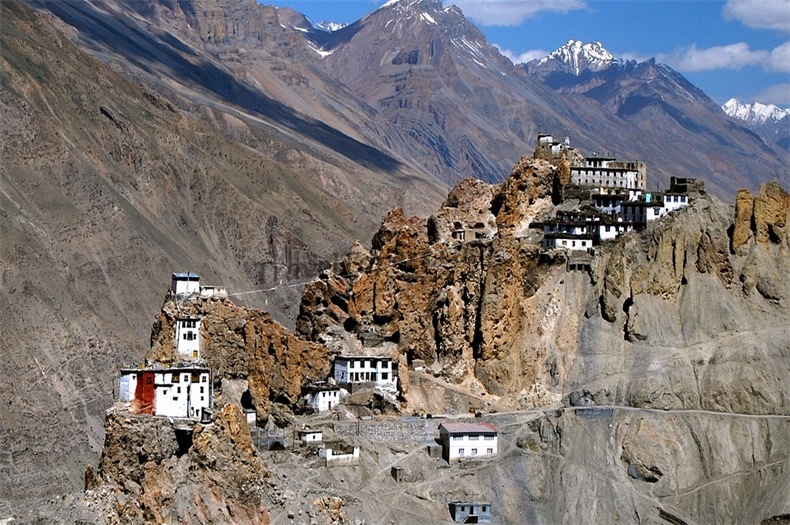 It was called Dankhar Monastery, and it was once the seat of the Spiti Kings. I ate and lived with the monks, under the kindly gaze of a very, very old lama called Du Khang Khentrul Rinpoche, whose mother never gave him a name but ‘Lama’ because he was already known to be a lama in her womb, when they lived in Lhasa. He is the most gentle being I have known, who hissed with laughter, sitting in this dry valley full of bones, in a room with an earthen floor, and a couple of Tibetan rugs. I drank butter tea with him, and listened to the bells of the temple cows ringing below, and the sharp winds that gushed down the valley through open windows that had no glass. It was the most extraordinary time of my life. I swore I could hear the earth breath here. When I looked into the eyes of the women with their cream yak shawls, their baskets full of dung, their weathered faces full of the lines of the rivers and the valleys of this pure land, I used to think they were just like the women of Aran in Ireland before they became like the mainlanders. 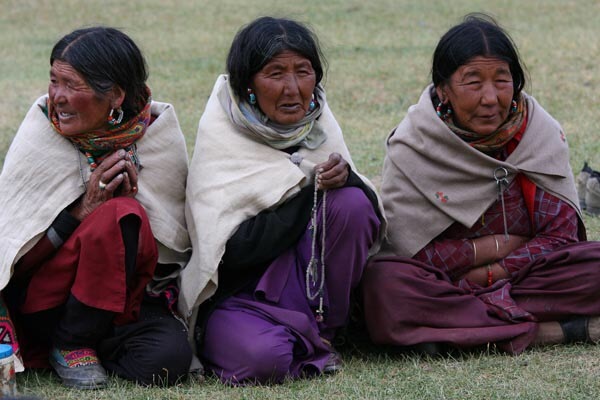 Those women, at the harsh mercy of the Atlantic, and these women in the Heart of a valley on the Tibetan border, were the same. They were of the land, as those Aran women were of the sea. By day, I studied Tibetan with my teacher in the monastery, and wandered sometimes into the village at night to sit around the stoves at night, and listen to the stories of the ‘bang-mo’, the witch, who guarded the bridges and sometimes stole people away. It was Ireland before electrification. The lama was called to bless the houses cursed with illness, and the ‘bang-mo‘ or some other roving demon was always blamed for this. And I always wondered what lay over the mountain ridges, in Tibet. I thought that one day, I would go there. In the next blog, I will tell you about the King of Spiti who worked in a government job down the valley. To read more, you can download my travelogue, Lost in Shambhala, here. A wonderful read, Siofra. You open the gate to a world filled with magic, with mystery, and a deep and profound humanity. Thank you. Thank you Sally Ann. It is an incredible place on Mother Earth. Wonderful stuff Siofra, beautifully written, it stirs up the inner nomad and causes itchy feet… exquisite! 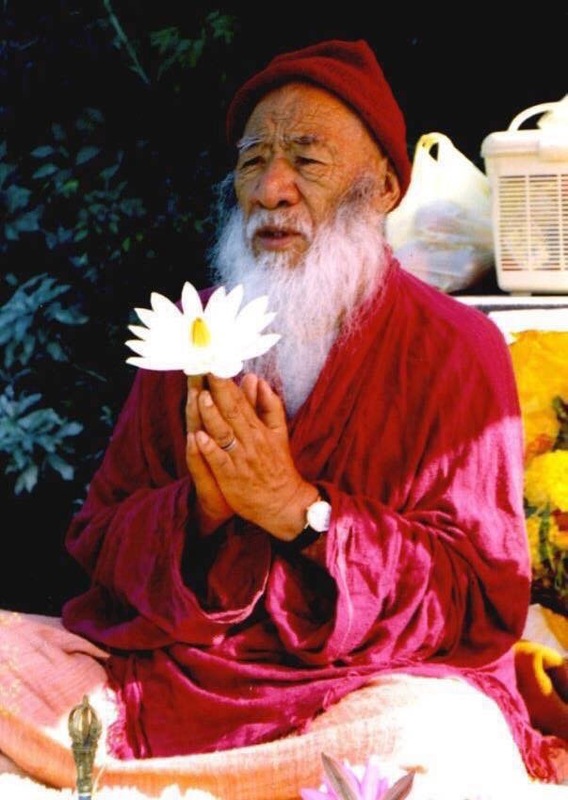 I love the photos too, gorgeous pic of Chatral Rinpoche. Thank you I actually went to the doctor recently for itchy feet. Not joking. This is another book- so bautiful to read as always you take me there- and I long always to to be with the monks again in Gomang – another life maybe! What fun. This is a very good read. Its very humane. Lovely read Siofra! GRMA, Daithi.